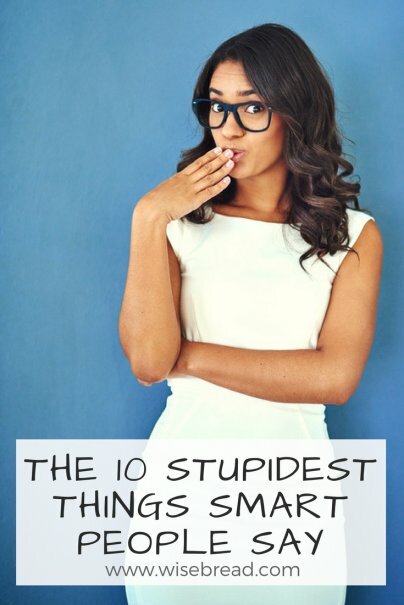 Here are the 10 stupidest words and phrases that smart people say. Most of the time what you really mean is "metaphorically." Sure, Merriam Webster has added the definition most people find technically incorrect to the dictionary. However, we still overuse the word in a way that sometimes does not fall into either definition. There are more illustrative ways to describe action than starting with "literally." While it may feel zen to say this, what you are really saying is, "I have nothing to add to the situation, no means of fixing it, and I can't even describe it." If you want to sound insightful, focus on one aspect and comment on that. This is a great example of a prefix that adds absolutely no value or meaning to the original word. Just say "regardless" and no one will think you're trying too hard, which is the hallmark of the ignorant attempting to sound smart! We used "like" as punctuation in high school, but sadly we've taken it into our adult lives as well. Even if you replaced every "like" with a pause, you would sound a tiny bit smarter. 5. "I Could Care Less"
We have all heard and dismissed this phrase when others use it, but even intelligent people use it from time to time. The correct phrase is, "I could not care less," because that is what you really mean. That said, it's an outmoded expression that we can all do without. There is always a hint of condescension when smarties use this word. One is trying to explain something in an understandable or relatable way, but it makes one sound as if he or she is "dumbing it down" for the other person. No one wants to sound like a jerk, right? Thanks to books, TV, and movies, saying "anyways" has been cemented as an indicator of ignorance. "Anyway" is a word, while "anyways" is the same word with an 's' added. Why add letters to a perfectly good word? 8. "Less" Instead of "Fewer"
Most people underuse the word "fewer" in favor of "less," and anyone who studied in a STEM field will cringe when you do. The simple rule is to use "fewer" with things you can count and "less" with things you can't. We'll use both definitions in a sentence: Fewer people should use the word "less," but unfortunately, people are less aware of its correct usage than they should be. Another bad way to start a sentence, "I really think" is a way of saying, "What I'm about to say can't be proven, and I am too arrogant to consider what you've said." Avoid this one to prevent sounding pretentious, which is something smart people do when they are self-conscious. Nearly everyone overuses these words, especially educated people. Simple language is almost always better; some better alternatives are "it seems," or, "it appears." Ten dollar words are a scourge. No one wants to converse with a college entrance exam. Agree? Disagree? Let us know (using proper vocabulary, of course) in comments below. I have found myself saying "to be fair" a lot more than I should. Its repetitive, annoying and, most of the time, I'm not actually being fair at all! I've also fallen into that trap. There are so many transitional pre-packaged phrases on which we lean! Good list; I agree with most of them. My current pet peeve: "is, is." As in, "what it is, is that I don't know how to talk properly." It's just filler. Skip the "what it is, is" part of the sentence and you will come across more concisely. Agreed – that "is, is" pause also makes it sound like one is trying to stall to figure out what he/she is saying, which is never good! < no teacher has ever referred to this as the "fewer than" symbol. More proof that there are many exceptions to the rule, especially when you juxtapose some math terms with grammatically preferred language. "It is what it is" plays an important part in 12 Step recovery. Because we don't always think it is. What it is. Here's another tip to not sound stupid: do some research. This article is based on prescriptivist language BULL that any ACTUALLY educated person--who knows even half a sentence about linguistics--would see right through. The most obnoxious lie on this list? The use of "literally" being wrong. The use of literally to mean "metaphorically" is WELL-DOCUMENTED in Tom Sawyer, The Great Gatsby, and multiple James Joyce stories. (Here's a primer: http://www.slate.com/articles/life/the_good_word/2005/11/the_word_we_lov...) The definition to mean "metaphorical" has been in Webster for LONG before the 2000s, so it's not a new "fad." Next time you try to write an article about not saying dumb things, stop and actually learn something. ("Could Care Less" is another great example of the ignorance of the person who wrote this article. Both "couldn't care less" and "could care less" are well-documented over the past hundred years.) Honestly, just spend a day reading the LanguageLog blog, from some actual academics who study and research language use. People continue to argue about these phrases to this day, so this article is to entertain those who do consider these phrases as pet peeves. It sounds like you have nothing to worry about! ... Since when is "apparently" a 10 dollar word? What do you mean? "Apparently" is a perfectly cromulent word. Something my husband used to say that drives me nuts: "How do I explain this?" He's in a STEM field, and when he would say this, he was trying to explain something fairly complex. But stating "How do I explain this?" beforehand just turns me (and other listeners) off since it sounds so condescending. Good one! That can definitely sound condescending. I don't think there's anything wrong with "apparently"! It's a perfectly normal, descriptive word that everyone understands. I don't think that it's a "10 dollar word", unlike ostensibly (which I agree, definitely sounds pretentious). For what it's worth, and with all due respect, I couldn't care less about this noise. Word! (a) The "really" is (well) really out of place. If one thought falsely our interest in that person would be even less. (b) I have given much "thought" (yes) to the exptession "I think" and I attempt to use it as unfrequaneky as possible. Why? because we are rarely dealing with Philosophy, " I think therefore I am" is more frquently than not out of its place. SOLUTION: Use the expression "In my opinion" (very bombastic) or - better "It occurs to me". (a) "It appears" and "Apparently" are pretty equivalent and it occurs to me that they are one to two dollars worth. In my (modest) opinion languages are the Humanity great treasures, and it pains me to hear people carelessly "massacrating" a lamguage - whatever language. Accordingly, I endeavour to use in my speech and writin the most appropriate word - and if it is a ten (or twenty) dollar word - so be it.